Raise your hand if you are Netflix obsessed! I sure am! Every night at dinner, Taylor and I sit down and watch Netflix together. We usually go back and forth between a series that is new to us, and a series that we've seen a billion times already. Right now, we are back on Parks and Rec, which is one of our favorites. I love the humor, I love the characters, and I love that Taylor and I both like it (which is often hard to find). 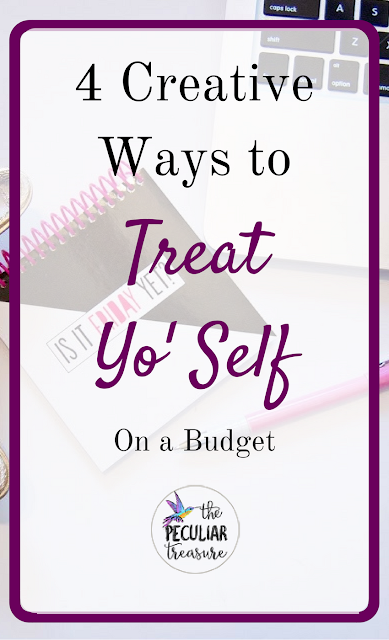 And if you watch Parks and Rec much, you've probably seen the "Treat yo' self" episode where Donna and Tom explain that they go on a yearly shopping spree where they treat themselves to basically whatever they want. As a 25-year-old woman with a husband in seminary, I cannot imagine living like Donna and Tom. I don't have much money to my name, and I definitely can't go out and blow it all (nor should I). However, one thing I appreciate about Donna and Tom's frivolous "treat yo' self" day, is that they see the value in rewarding yourself every now and then. It's not wrong to buy yourself a little treat here and there, and they get that (and run with it much further than I would). 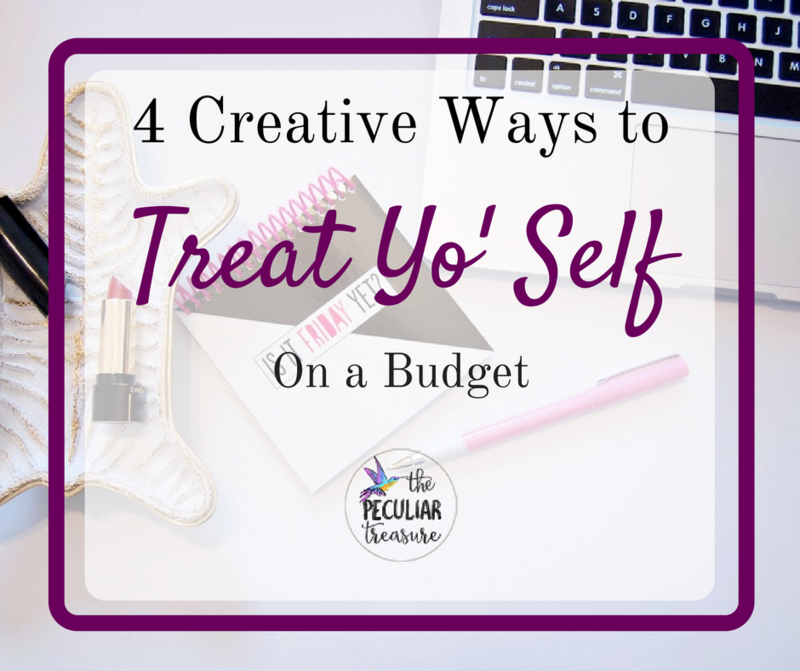 So for those of us who can't afford to go on a crazy spending spree but still want to treat ourselves, I've come up with four different ways we can treat ourselves on a budget. Buy a "new" outfit from Goodwill. When I think of treating myself, one of the first things that comes to mind is a new outfit. But being the financially-challenged gal that I am, a new outfit is not always feasible. However, Goodwill is almost always within my budget. I know that you really have to look through clothes-upon-clothes at Goodwill to find something that both fits and is in good shape. It's more work, for sure. But there are nice clothes at Goodwill (and other thrift stores) if we will take the time to look. There are even some stores that get brand-spankin'-new clothes from well-known retail stores on a certain day of the week. When I lived near Asheville, there was a huge Goodwill that got new clothes from Target once a week, and a shirt that would have been $15 in Target was $4-$5 in Goodwill, still with the tags on. If you want to treat yo' self with clothes, but you are on a shoe-string budget, it's worth looking into. Recently, I learned about Groupon Goods, as a way to "treat yo self" without breaking the bank. I mean, we all know about Groupon for deals and coupons, but I didn't know about Groupon Goods until very recently. In the spirit of honesty, I just placed my first order from Groupon Goods, so I cannot give you a review of my purchase. However, Groupon Goods offers reviews on the products they have up for grabs, so you can be well-informed before buying. I am absolutely in love with their prices for essential oils and diffusers! I have been wanting to use EOs for quite some time, and I have had samples, but I have never been able to afford brands like Young Living or DoTerra. But Groupon Goods is offering 100% pure essential oils for half the price of those big-named companies. And just so you know, you can use these oils in a bubble or salt bath if you wanted to make your own, at-home spa day! Speaking of a spa day, one of my favorite things to do when I get off from work is to go home, run a hot bath, and read while I soak in smelly-good-stuff. Anything works, really. If all you have is body wash, then use that. But most retail stores have scented Epsom salts and relaxing bubble bath soap for pretty cheap. A bag of Epsom salts cost under $5 and will last at least three uses (and really more like six for me). That's a pretty cheap treat if you ask me! I'm not gonna lie- my favorite reward is yummy food. I love going out to eat for a nice meal, eating wayyyyy too much, and then going home and laying on the couch. But meals out are so stinkin' expensive (especially when your favorite food is steak). But if you really want to treat yo' self with food, why not save some money by cooking it yourself? With all the "copy cat" recipe's on Pinterest (like this mouth-watering copy of an Olive Garden favorite) the sky is really the limit. Plus, if you have a discount grocery store near you, that's even better. We shop at Aldi (owned by Trader Joe's), and we save SO.MUCH.MONEY. They have good meat specials, awesome frozen veggies that taste great, as well as some gourmet specialty foods that vary by month. Between the prices at Aldi and the dupes on Pinterest, there's no reason we can't treat ourselves with phenomenal food. Guys, there are so many different ways to treat yo' self without breaking the bank. We just have to get creative and be willing to put a little more effort in. But that doesn't change anything. It's still a treat! So go on. Treat Yo' Self! Great ideas! Just have to look for those deals, think outside the box, and make the most of things. I love these ideas! I really enjoy using Groupon to indulge in new experiences I normally wouldn't try. It always feels like such a treat! Thank you, Cara! So true! I love having at home spa treats. Especially with my sisters. Time with "the girls" is so needed sometimes. That definitely is a good way to treat yourself! I absolutely love group on deals!! We have one Aldi's down here and it's super cheap! But the trader joe's is so much closer so I always go to the parent company. These are great tips Kristin! Aldi is great! There are several in Charlotte, and the TJs is actually in a SUPPPERRR busy area so I stay away most of the time. haha. Thank you, Rachel! I appreciate it! Cooking myself a gourmet meal (as you may have guessed from my insta feed) or indulging in a spa day at home are two of my favourite ways to treat myself. little indulgences can make all the difference to your state of mind! I hadn't heard of them until VERY recently, Laura! I am excited to get my purchase from them and see how I like it. Food is almost always the way to my heart, so I absolutely agree. Great ideas! Something I definitely need to do more often. These are great - I do need to treat myself sometimes but I always spend too much when I do. I have a Goodwill down the street and it can be great. I really like to go there for Halloween costumes. A lot of times they have brand new costumes left from last year at really low prices! Love these ideas! I definitely am in need of an at home spa day! An at-home spa day is always the best! Such great ideas! I never thought about Groupon Goods for essential oils. That is an awesome idea because I can't afford the other ones either. These are great tips! I love fixing a fancy meal that I didn't go over-budget on! It makes me feel so classy, talented, and my wallet is happy. Cooking is TOTALLY a self-love language! If I manage to cook something "gourmet"...Lord knows it's a BIG treat yo'self day in my house! My husband and I can walk to Kroger, so we usually shop there. But about once a month or so, we make it to Aldi's (which is only a 5-minute drive away, but that feels like forever when Kroger is a 2-minute walk). I definitely stock up on my fancy snacks like pistachios and olives, both of which are cheaper at Aldi than anywhere else. We also buy Winking Owl wine! I haven't heard of Winking Owl Wine. Is that from Aldi? I totally get that! We have a Food Lion .2 miles from our house, so we often just go there out of convenience.